Swipe left or tap to advance Introduction to AirPoint. 3 What is AirPoint? 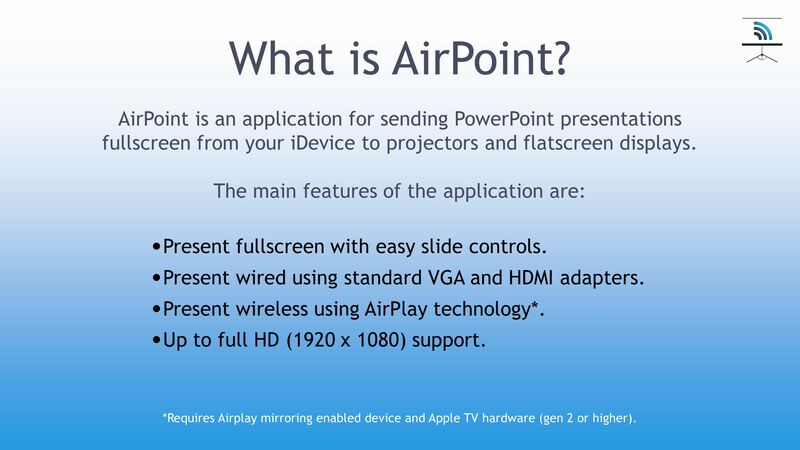 AirPoint is an application for sending PowerPoint presentations fullscreen from your iDevice to projectors and flatscreen displays. The main features of the application are: *Requires Airplay mirroring enabled device and Apple TV hardware (gen 2 or higher). Present fullscreen with easy slide controls. Present wired using standard VGA and HDMI adapters. Present wireless using AirPlay technology*. Up to full HD (1920 x 1080) support. 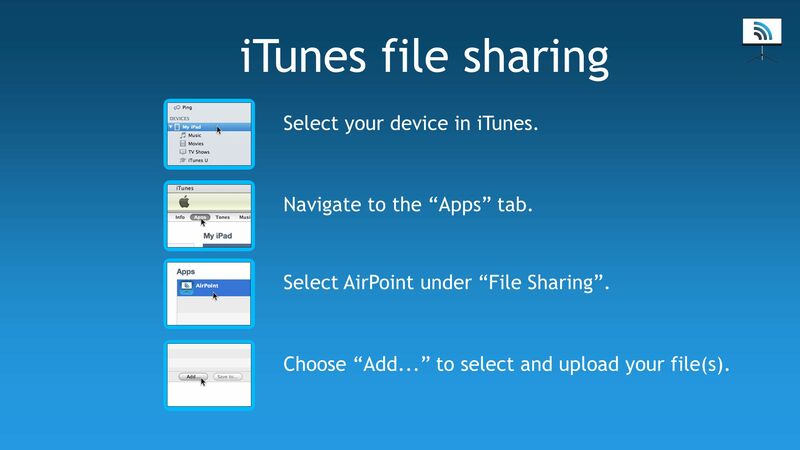 5 iTunes file sharing Select your device in iTunes. Navigate to the Apps tab. 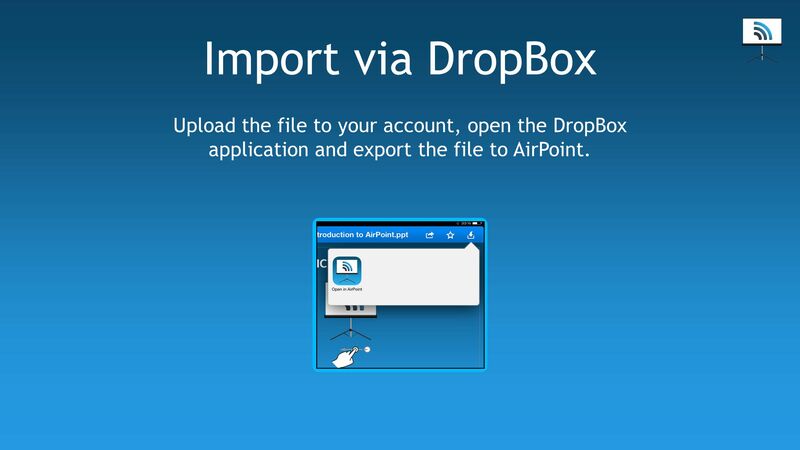 Select AirPoint under File Sharing. Choose Add... to select and upload your file(s). 7 Import via DropBox Upload the file to your account, open the DropBox application and export the file to AirPoint. 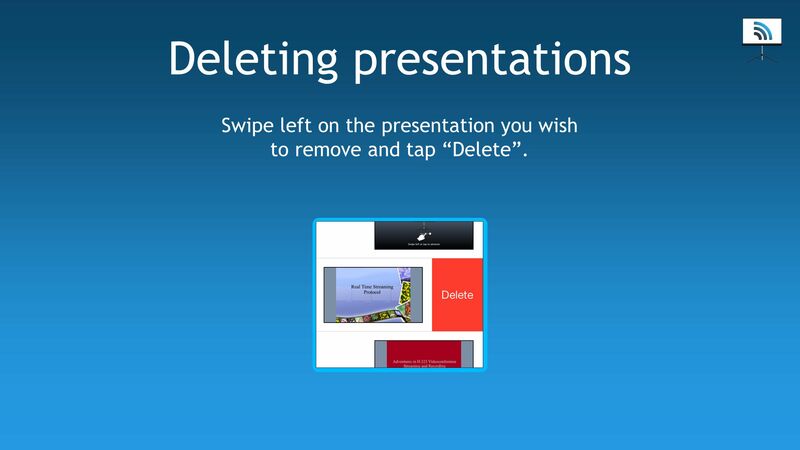 8 Deleting presentations Swipe left on the presentation you wish to remove and tap Delete. 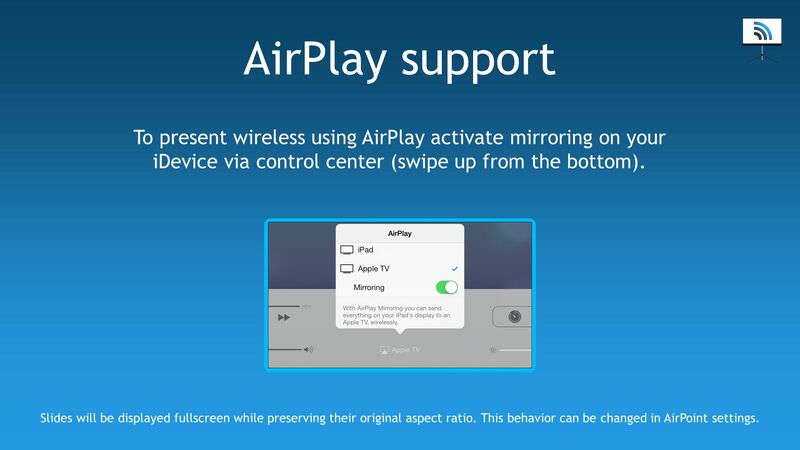 9 AirPlay support To present wireless using AirPlay activate mirroring on your iDevice via control center (swipe up from the bottom). Slides will be displayed fullscreen while preserving their original aspect ratio. This behavior can be changed in AirPoint settings. 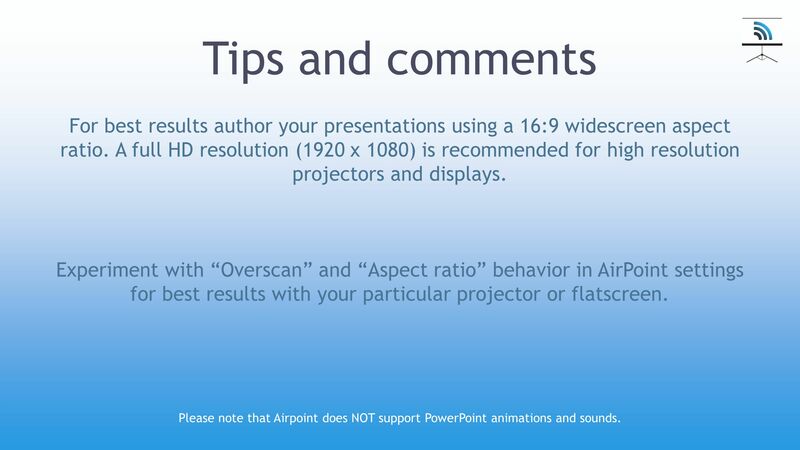 10 Tips and comments For best results author your presentations using a 16:9 widescreen aspect ratio. A full HD resolution (1920 x 1080) is recommended for high resolution projectors and displays. Experiment with Overscan and Aspect ratio behavior in AirPoint settings for best results with your particular projector or flatscreen. 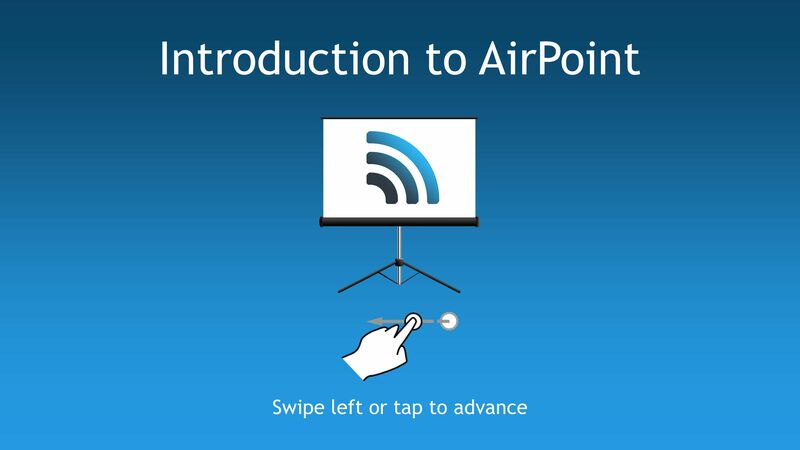 Please note that Airpoint does NOT support PowerPoint animations and sounds. 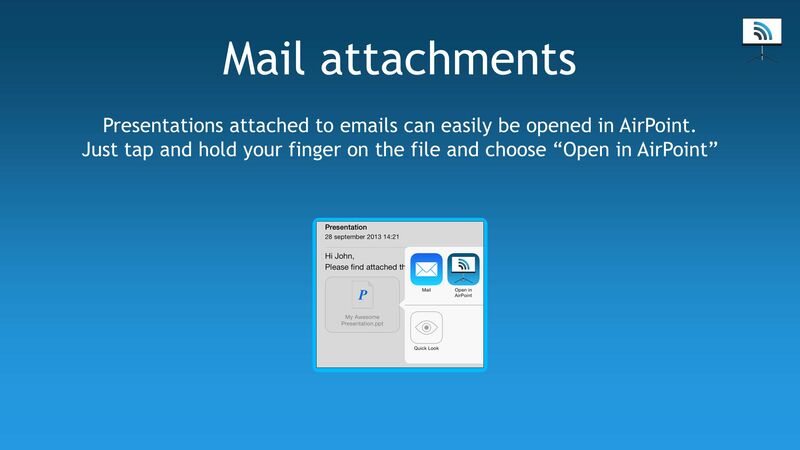 Download ppt "Swipe left or tap to advance Introduction to AirPoint." Widescreen Presentation This template is formatted with a 16:9 widescreen aspect ratio. Its a great way to take advantage of laptops, televisions. Excel Lesson 17 Importing and Exporting Data Microsoft Office 2010 Advanced Cable / Morrison 1. VPH 2014 ePoster Template - Title: 34pt bold Authors and affiliations: 13pt bold Headings: 17pt bold Content: 15pt Preparing Your ePoster for the VPH 2014. IPads for SSHS Math Dept. Creating your Personal Learning Environment…. IPad Basics An ERL Brownbag Workshop. Getting to know the iPad 1)Home Button 2)Dock Connector 3)Speakers 4)Hold Button 5)Antenna Cover 6)Mute Button 7)Volume. This document guides you through using the common features of the InFocus™ Mondopad™ touchscreen display located in this room. Getting Started Power Display. ® Microsoft Office 2010 Appendix A: Introduction to SkyDrive and Office Web Apps. 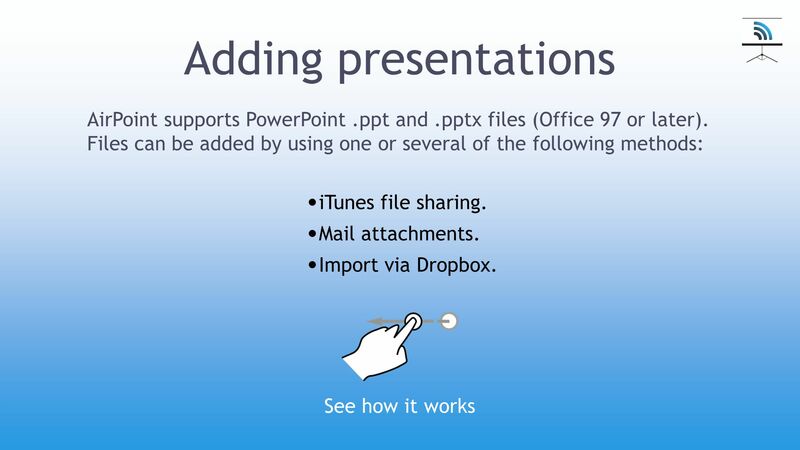 Microsoft Office PowerPoint 2013 Microsoft Office PowerPoint 2013 Courseware # 3256 Lesson 7: Preparing the Slide Show. 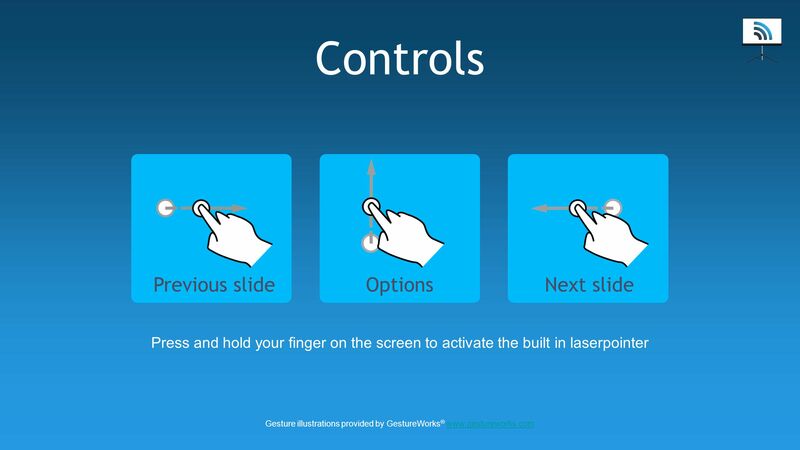 WIDESCREEN PRESENTATION Tips and tools for creating and presenting wide format slides. Introduction. Stop the expense and inconvenience of hauling a laptop… … with your handheld and Impatica ShowMate. Break Free Today! Break free from your. Kabel Nathan Stanwicks, Head Circulation and Media Services Department Electronic Reserves Introductory Tutorial for Faculty. Office 2013 and Windows 8: Essential Concepts and Skills Microsoft Access 2013.